A dry day was forecast though it was initially cloudy and damp as the 27 walkers set off from Aberdeen on the short journey to the start of the walk at Potarch. All were in good spirit and glad of the exercise following the Christmas and New Year period. 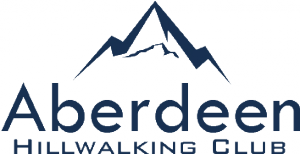 Most of the walkers alighted at the car park at Potarch with 3 staying on the bus to travel to Aboyne for local walks in this area. The main group followed the good path along the signed Deeside Way , through the village of Kincardine O’ Neil before taking the minor road towards Townhead and into the woods near Dess House. Some tricky navigation saw the party split into 2 groups with the majority heading uphill on an overgrown path towards the upper Dess waterfall. Others continued on the better path arriving at the new bridge downstream from the waterfall. The party regrouped at the Falls of Dess where lunch was taken before continuing to cross over the new bridge and head towards the old railway track coming from Lumphanan. We continued on the old line track as it passed the Loch of Aboyne and the edge of the golf course before enentually entering Aboyne and proceeding to the main Square where our bus was waiting.